The 1080p standard saw wide adoption around 2006. In the years since, video technology has gone much further. Ultra high definition 4K content brings something totally new things to the table. Pixel for pixel, UHD is significantly more detailed than full HD. Putting resolutions aside, technology like HDR has become a popular way to help exceed the standard color gamut. These technologies are still relatively new. But you can already find some impressive 4K TVs for only a few hundred bucks. It may only be a couple of years before the 4K bandwagon starts to pick up speed. Whether you’re trying to take advantage of those cutting edge technologies today, or you’re looking for future-proofed equipment, you need equipment that ready for the task. Some cameras are simple and intuitive. Simple enough to hand over to a friend who’s never used the device before, and with a two-second introduction, allow them to start shooting. The XF705 4K Professional Camcorder is not one of those cameras. The XF705 is a precision instrument, intended to deliver the full artistic potential of the device, for those who have the technical ability to unlock that potential. Among its strengths, you’ll find a ridiculously compact design, and wide support for HDR and 4K UHD. These two things combined makes the XF705 ideal for outdoor events, active sports, news shoots, gatherings, and documentaries. 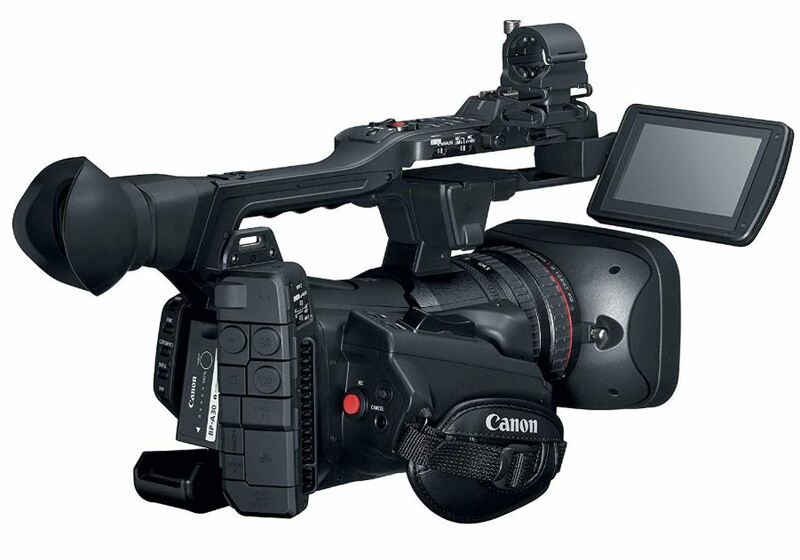 Like any highly technical instrument, the Canon 4K XF705 is absolutely covered in controls. From top to bottom, there are analogue controls, digital controls, mounting spaces, expansion ports, and multiple displays. To a novice user, it’s nothing short of intimidating. The majority of these controls are bunched together on the left-side of the device. It’s here where you’ll find more than two dozen different control options. And it’s here you’ll find the ability to fine-tune just about every aspect of the XF705, from the focus, to the shutter, to the microphone gain, to the white balance. On the right side, you’ll find a handful of microphone controls, trigger-button, and sealed input ports. Before you’ve had a moment to soak all of those controls in, you flip to the bottom side of the XF705, revealing even more controls. A full set of six media buttons, menu, index, and conformation button. And next to that, a bright-red record button, and a zoom trigger. Suffice to say, the XF705 is adjustable. Then there are the digital controls. The XF705 4K Professional Camcorder uses a 4” touch LCD panel to help make things a bit more intuitive. Tap once to deploy autofocus, just tap on the area you want to focus. The continual autofocus is possible through about 80% of the XF705’s maximum range. Like with recent generations of Canon’s professional equipment, there’s a Face Detection autofocus feature. Similar to the autofocus, you can initiate this mode by tapping on a face. Once set, it can be switched between face-only and face-priority mods. True to its name, the face-only mode will only focus on faces. The face-priority mode will focus on the environment only if a face isn’t available. Someone turns to run out of the shot? The thing they’re running towards, or away from, gets brought into focus. It’s little bits of control like this which create far greater flexibility for the kinds of scenes you can shoot. The entire touch panel LCD is positioned on a rotating swivel, allowing the monitor to rotate freely in all directions. There’s also a 0.46” OLED electronic viewfinder. Looking through the viewfinder, your eyes are treated to 1.23 million dots of light, giving you all the assistance you need to be sure you’ve got the shot. Last but not least, there’s a small OLED display to give you information about audio. Whether you’re recording with onboard audio or you’ve connected to an outside mic, it’s nice to be able to eliminate all concerns about whether or not you’re capturing the audio and not just the video. Saving 4K content requires about four times as much data as 1080p content. The XF705 captures all that data with a large 1” CMOS image sensor. From the sensor, data passed on to dual DIGIC DV 6 Image Processors. Teamed up with the DIGIC DV 6 image engine, the XF705 manages to keep visual noise performance in check. This fairly large sensor allows for equally large photo-sites, producing considerably less noise when you’re shooting within low-light situations. Another bonus of having this large sensor is a shallow depth of field when you’re shooting with a large aperture. That helps deliver greater depth of field control for whatever kind of creative shot you have in mind. 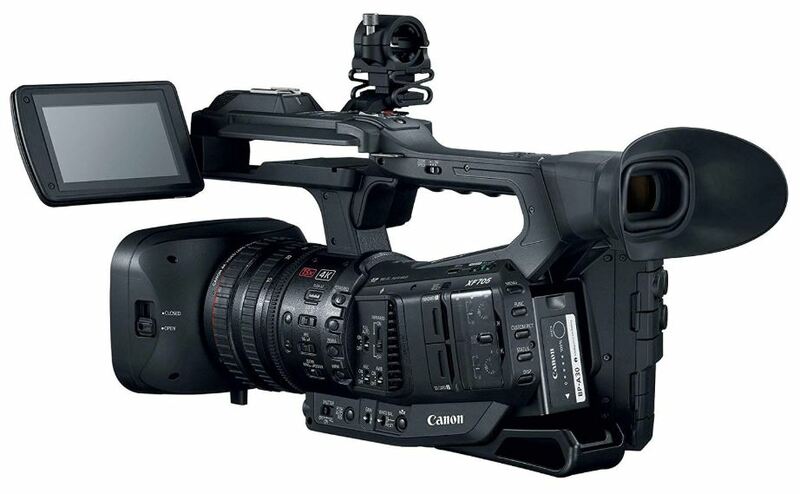 Living up to its name, the Canon XF705 4K is capable of recording 4K content up to 60fps. In the interests of maximizing storage space, it’s also possible to drop towards lower resolution capture. With respect to audio, the XF705 provides a four channel LCPM. There are a pair of XLR inputs for further control options, and you can control the audio either automatically or with manual adjustment. And stretching beyond UHD support, the XF705 has formidable support for HDR content. You can actually record in the two most popular HDR formats: Perceptual Quantization and Hybrid Log Gamma. Either selection can faithfully capture the vivacity of colors. The Canon XF705 4K can shoot almost anywhere. But it does have a minimum subject illumination of roughly 1.5 lux. With a 1/30s shutter speed, it’s about the amount of light you get from a fistful of birthday candles. Looking to make some adjustments to the color of your next shot? Take advantage of the independent neutral density filter. Using analogue controls on the left panel of the XF705, you can select between ND 1/4, 1/16, 1/64, or ND off. In addition to slow-motion, there’s also a fairly formidable fast-motion mode, raising the shutter speed up to 120FPS. That works out to roughly x0.2 speed while maintaining 1080p. It’s great for helping speed things up when shooting action or fast-paced motion. Film makers who are avid fans of J.J Abrams will be endlessly pleased to learn the XF705 supports a broad selection of lens flares. The 9-blade iris lens design allows for a variety of creative out-of-focus shots and lens flares. 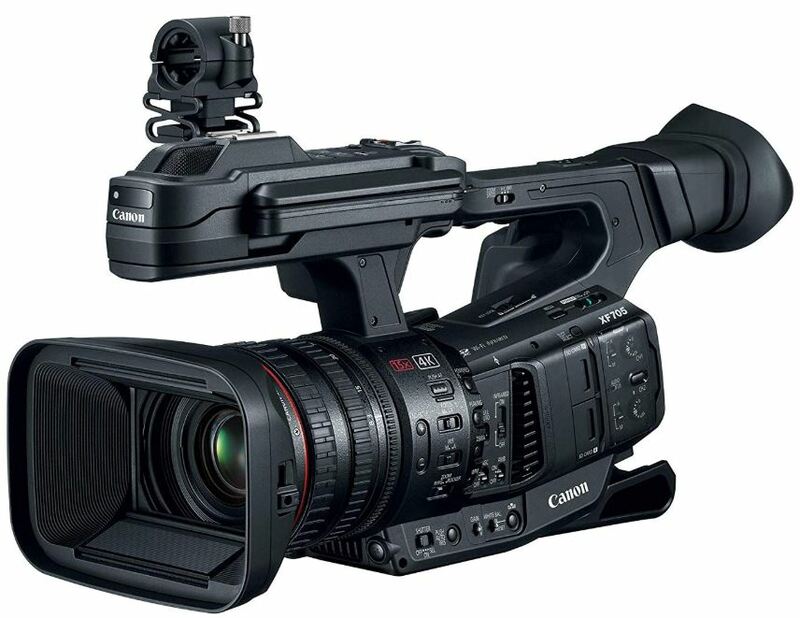 The XF705 is the first Canon camcorder to take advantage of the H.265/HEVC codec. It delivers roughly twice the compression ratio of comparable mainstream technology like H.264/AVC. And that translates to quite a few hours of extra capture on your SD cards. There are actually two SD card slots, helping you create either relay recording or simultaneous recording. When recording simultaneously, both cards get a copy of what you’re making. What can be more secure than always having a backup? When you’re using the relay recording, you move from one card to the next as one fills up. That delivers 160/110Mbps bitrate capture. With a 128GB card capturing 4K content, it works out to roughly 20-minutes of recording time. Adding 128GB to each slot, or adjusting the bitrate of the capture, those figures can be adjusted. Note, using SD card ports instead of internal memory helps ensure the XF705 remains a formidable camera in the years to come. We can expect the memory of SD cards to increase over time, the same can’t be said for whatever is built inside a camcorder. Inside the XG705, there’s a fairly adaptable 15x optical zoom lens. You can move up and down the focal length, from 25.5mm to 382.5mm, and you keep 4K the entire way through. For those who are keeping track, that’s equivalent to 35mm film. How adaptable are we talking? For starters, you can use a digital zoom of 30x, but it requires you to down-toggle to 1080p. The Canon XF705 4K pulls that digital zoom from the exceptionally large sensor, extending the effective range. While shooting in full HD, you can reach as far as 765mm focal length. The XF705 uses a 5-axis optical image stabilization system, delivering 3 unique modes you can select between. The dynamic mode works by extending the stabilization at the wide end of focal length. For example, to help you stabilize a shot while walking with the camera. The standard mode keeps the angle constant, independent of magnification. And the powered stabilization mode helps stabilize the low-end range of a tele-shot. The XF705 includes a WL-D6000 remote. The remote does not come close to capturing the full complexity of the XF705. But it does provide essential controls like media control buttons, zoom control, the ability to snap photos, and so forth. You don’t necessarily have to insert-and-remove your SD cards over-and-over to transfer things around. Built-in Wi-Fi helps transfer proxy files. Getting your hands on those files is as simple as connecting to the web through a browser. Optional accessories are always on the table because it’s Canon. With respect to the XF705 4K, that includes TL-U58 tele converter, WA-U58 wide attachment for 0.8x wider angle of view. The tele converter extends 1.5x telephone range for the fixed lens. Using these accessories, focal lengths shift to 20.4mm and 1147.6mm respectively. 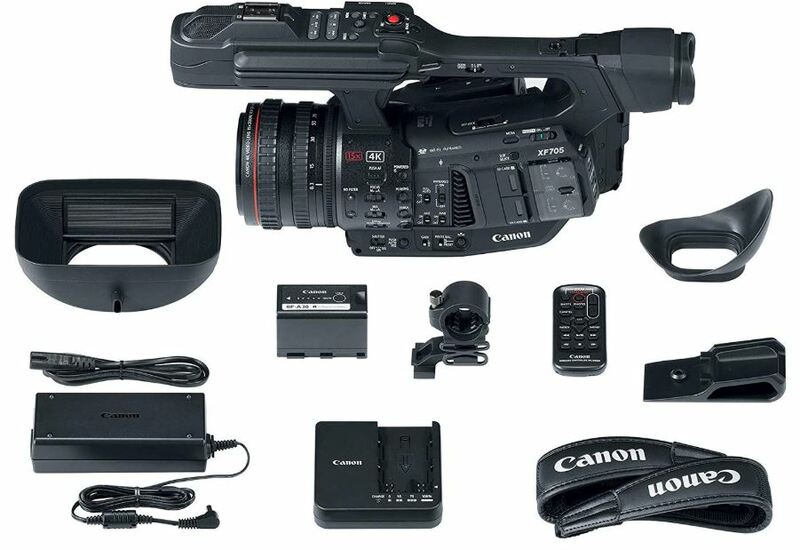 Who Should Choose the Canon XF705 4K Professional Camcorder? There’s a fair amount of cutting-edge technology in the XF705. What’s impressive isn’t simply that the camera delivers 4K, but it’s how it delivers those shots. There’s dual support for the biggest color formats, delivering 4:2:2 10-bit color. And with the help of its giant CMOS sensor, the zoom is pretty impressive for a handheld. For every mode, for every feature, the XF705 has a bundle of sub-features. You stabilize in one of three modes, choose between multiple color modes, and so forth. The digital codecs used to compress and save data, paired with dual SD card slots, reflect the general rigor of the device. Total adaptability for the Canon XF705 4K is nothing short of world class. Perhaps in a few years, people will look back on 1080p footage as small and unbearably grainy. 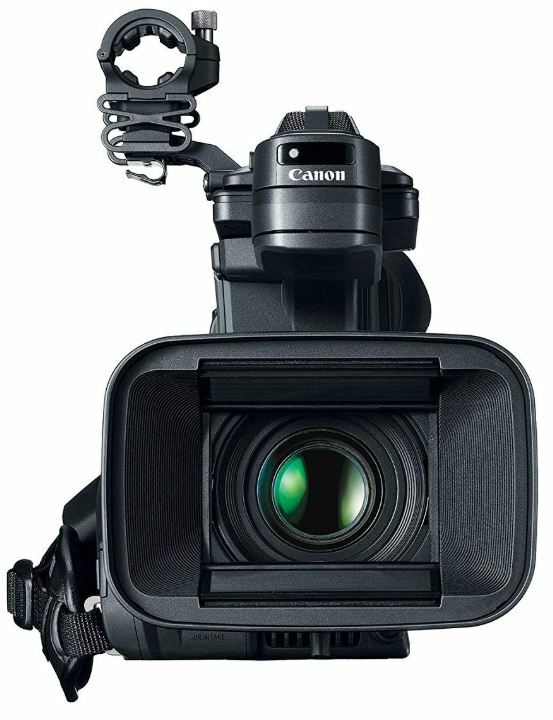 In either case, the Canon XF705 4K Professional Camcorder has all the technology to be ready for the future. It’s a highly capable instrument that’s worth a close look for anyone interested in cutting-edge recording tech.